Show your passion for your community become one of our Founding Smart & Caring Donors with your pledge $10,000. Together let’s create a $1.5 million fund – a significant, collective legacy birthday gift to our community – Canada’s first capital. A unique opportunity to mark Canada’s 150th anniversary of Confederation and make our community Smart & Caring for years to come. Take advantage of the tax benefits of gifting appreciated securities. Click here or contact us for details. Make your gift or pledge now through Canada Helps by clicking here. Send a cheque payable to “Community Foundation for Kingston & Area” and sent to us at 165 Ontario Street, Suite#6, Kingston, ON K7L 2Y6. You can download a pledge card here, or simply contact us directly to confirm your pledge and how you would like your name(s) to appear in our recognition materials. 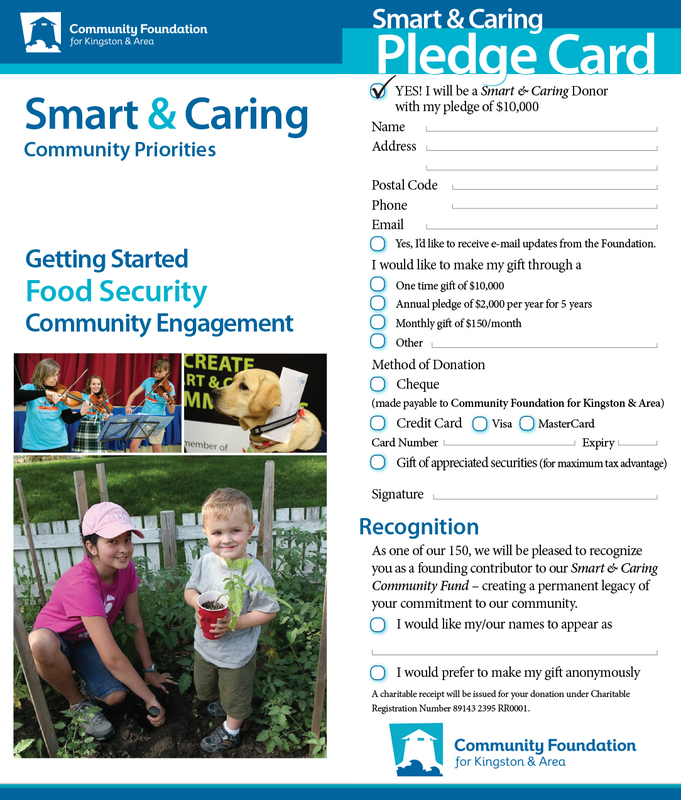 To recognize your generosity, you will be listed permanently as a contributor to the Smart & Caring Community Fund. Click here to see the list of Founding Contributors to date. A charitable receipt will be issued for your donation. Caring is what we do. Smart is how we do it. Now and for years to come.